It’s 1194 and Sir Faucon de Ramis, the shire’s newly appointed Keeper of the Pleas, must do his duty and make an official declaration of the cause of a miller’s death. Saddled with a clerk who names Faucon his ‘penance, the shire’s first Crowner must thread the tangled relationships between the sheriff, the village of Priors Holston and the priory that once ruled it. As a simple task takes a turn to the political, what seems obvious isn’t and what appears safe turns out to be more dangerous than he could imagine. I recently had the pleasure of being asked to read and review Denise Domning’s new book ‘Season of the Raven’, the first book in her Season of the Crown Mystery Series.My first introduction to Denise’s writing was through her series ‘The Graistan Chronicles’, a medieval romance series which I thoroughly enjoyed .Season of the Raven is set in the same time period, beginning at Michaelmas in the Year 1194. Whilst this first book solves one murder, Denise has used the book to set-up a continuing backstory which I imagine will continue through the series. To say more at this stage, would reveal too much for the new reader, suffice to say there is much to look forward to in this new series.Season of the Raven introduces us to Sir Faucon de Ramis, a former Crusader who travels to the tiny village of Blacklea. He is to meet his Uncle, Bishop William of Hereford and is surprised to discover another relative, Lord Rannulf Graiston is also in attendance. Both Bishop William and Lord Graistan are characters from ‘The Graistan Chronicles’ and Denise has neatly tied this new series to the old with the appearance of much-loved characters from the past.Sir Faucon discovers he has been named as the Keeper of the Pleas for the area surround Blacklea, which will provide him with an income, whilst allowing him to build a life of his own. It also lumbers him with an overbearing and bossy monk, Brother Edmund as his clerk.From here the story moves quickly, as Sir Faucon finds himself called to the village of Priors Holston, where the local miller has been found dead. Initially it would appear the death of the alcoholic man was accidental, but as we soon find, there is much more to this death than meets the eye. As the story progresses, Sir Faucon finds himself wading into unknown waters, coming to terms with his new job, whilst trying to deal with his annoying, interfering and officious clerk. Denise has written a wonderful story, She has a mastery of medieval times and brings the history to vivid life. 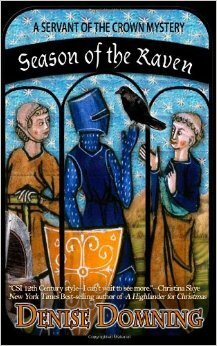 Her creative prose is wonderful and brings the medieval period to the readers lap. The characters are well-rounded, and as the relationship between Sir Faucon and Brother Edmund continues, we get a better understanding of each man and their reasons for what they do whilst investigating the residents of Priors Holston. I particularly enjoyed the evolution and it will be interesting to see how it pans out in future books. I would highly recommend this book to lovers of books set in the medieval period, but equally, it is a great mystery for those who enjoy a solid murder with all the follow-up detective work required. This book was particularly entertaining in this regard, introducing us to a second monk, Brother Colin who is the Priory Herbalist and integral to discovering that the death was murder and not accidental. In a modern world where technology is so important in homicide cases, to read about using very basic methods of deduction was both interesting and well-written. I very much hope Brother Colin will make appearances in future books.